Mariah Wind Quintet performs beautiful music appropriate for any event, designing presentations individually for recitals, educational programs, and social gatherings. 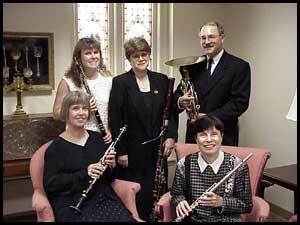 After fifteen years performing together, this colorful ensemble featuring flute, oboe, clarinet, horn, and bassoon has built a repertoire of diverse international wind quintet literature in addition to transcriptions of music from ragtime and jazz, movies and Broadway shows, and opera. A repertoire list is available on request and we will be happy to assist with programming suggestions. Weddings and religious services are well served by this unique instrumentation, as our many delighted patrons will verify. We offer preludes, postludes, and processionals, special requests and distinctive and reflective music. Our recitals include a vast repertoire selection, including music written originally for wind quintet instrumentation and transcriptions of familiar music. We bring out entertaining and informative aspects of the music we perform, and we enjoy involving the audience in appropriate pieces which enliven our performances. In our school programs, Mariah musicians demonstrate the instruments of the woodwind quintet with solo pieces for all five instruments. We explain how the tone is produced, and provide a close-up look soloists. It is not unusual to find included onstage "instruments" from the kitchen and garden. We reinforce proper concert etiquette in a short suite of five movements, with instructions about when to applaud. With our rendition of "Liberty Bell March" a favorite teacher or principal may be asked to solo with the group and ring the "Liberty Bell", joining us for bows in the end. Workshops for bands include personal and small group instruction with help on the basics of wind instrument performance- breath support, practice routines, solo repertoire and reed making for the double reeds. A workshop may conclude with a concert including selected students. Opera Selections, Early Quintet Music, and hundreds more.